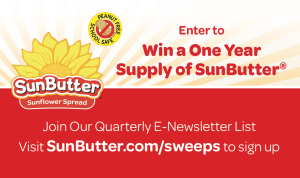 Join our quarterly E-Newsletter List to enter for a chance to win a one year supply of SunButter! The quarterly SunButter E-Newsletter is filled with coupons, recipes, allergy information, product news, and much more. Please complete the form below to enter, and join us on social media (links below) for an additional chance to win. 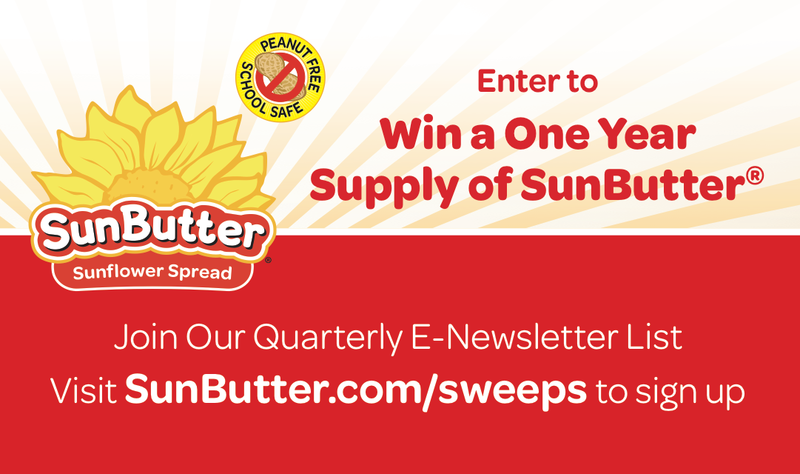 Click here, to view the official SunButter E-Newsletter Sign Up Sweepstakes rules. Sweepstakes ends December 31, 2016. Click here, to download your FREE Peanut Free School Safe Recipe Book! Over 25 peanut free, tree nut free and delicious recipes that are safe for school, after-school activities, kids sports, and other activities.